This book is fun, a little quirky, and definitely silly. In fact, the characters in this book are confused as to what this book is even about! The number 1 is pretty sure the book is about numbers (because why wouldn't it be? Numbers are naturally superior to letters! ), whilst the letter A is pretty confident the book is about letters (as it should be! After all, books are written with letters, of course!). 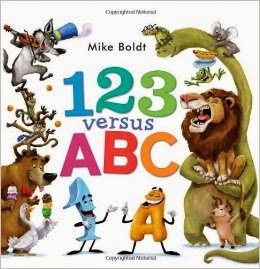 Chaos and mayhem ensue when more and more characters enter the book, each able to represent both a number and a letter, eg: 1 alligator, 3 cars, 5 eggs etc .. This does nothing to resolve the dispute, but what it does do is make for a zany read. Boldt's illustrations are marvellously engaging. What can I say? His narcissistic numbers and letters make me smile, as do his glasses-wearing turtles and violin-playing wolves. I appreciate a story that isn't your standard narrative, and this cute book certainly isn't. Light conflict makes for an interesting premise, and the speech bubbles will attract the pre-schooler (and up) eye. I highly recommend this book. I would note that whilst the book is officially recommended for those ages 4 – 8, I'm pretty sure some savvy 3 year olds would love to get their hands on a copy.